If you are curious regarding the future of residential lighting, and may have some questions regarding the lighting choices of today, you will want to attend our monthly meeting on Tuesday, January 26th. Mark Tudyk from the Gallery of Lighting will be in the house (I can't believe I actually used that expression) at this month's meeting to relate the latest on lamp (light bulb) choices, daylighting issues, and lighting controls. Mark was a valuable resource during my years at Build San Antonio Green in lighting-related issues in green building and remodeling. I'm sure you would like to consider him as your lighting resource as well. Are LED's (light emitting diodes) ready for prime time yet? Are they affordable yet? Do they perform as promised? How do we know they will last 20 years? Does their lumens per watt highly out-perform compact fluorescents? And what about those Energy Star light fixtures? Are they only able to receive a particular type of compact fluorescent lamp? And if so, are they going to be able to be easily modified for LED lamps? Oh boy, these are a lot of great questions, so make sure you attend as Mark is warmly welcomed by San Antonio Sustainable Living and then be put on the hot seat. As usual, our meetings are the 4th Tuesday of the month held in the classroom inside Whole Foods Market in the Quarry Shopping Center at 7pm. Hope to see you then. What a delicious way to enjoy healthy green vegetables! Source: Healthy Eating for Life to Prevent and Treat Diabetes by Patricia Bertron, R.D. ; recipe by Jennifer Raymond, M.S., R.D. Pliny Fisk of Austin's Center for Maximum Potential Building Systems helped the 2007 Texas A&M Solar Decathlon team with a solar demonstration home called the Aggie GroHome. After being displayed on the mall in Washington and then at A&M the home was disassembled and moved to San Antonio. It has been reassembled on the grounds of the former Cooper Middle School, at 1700 Tampico Street. The house features modular construction, so the home can “grow” as the needs or usage change. It has a total of 465 square feet of indoor living space, with dining room, living room, entry, bedroom, patio and garage modules. The modules are the same size, except for the entry module so they can be arranged differently, up graded, replaced or added to in the future. The dining, living, entry and bedroom modules are at the center of the house and have windows at the top of high walls for daylighting. The kitchen extension includes a refrigerator, stove, microwave and dishwasher. The house includes space and hook-ups for a washing machine and dryer. The deck which surrounds the house has places for reflecting pools or gardens. The house features 3 types of solar panels with batteries to store the power, a high efficiency heat pump, an energy recovery ventilator and dehumidifier, light wings for shading windows, slatted rain screens, a solar heated water storage tank and is designed to incorporate three small wind turbines. A grand opening ceremony for the house (renamed SU CASA in the Mission Verde Center) including tours of the house will be Monday, January 25 at 1 pm at 1700 Tampico Street, San Antonio 78207. 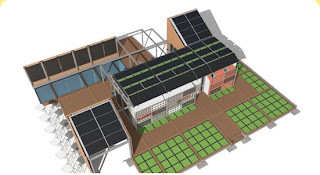 For the project's relation to the South Texas Nuclear project expansion check out the Current's Greg Harmon's posting on the house: Cooper Center bringing green tech, training to West Side . 2.) Cook the new potatoes in a large pan of salted boiling water for 5-7 minutes, until tender. Steam the green beans and broccoli for 3 minutes until they are tender. 3.) Cook the spirali in a large pan of salted boiling water for 10-12 minutes until al dente. Drain, reserving 2/3 cup of the cooking water. Return the pasta and reserved water to the pan. Add the precooked potatoes, beans, broccoli, pesto and seasoning, then stir until combined. Heat over a gentle heat for 1-2 minutes, then stir in the tomatoes and toasted pine nuts. Per Serving: prot. 18.5 grams; fat 22.7 grams; sat. fat 2.78 grams; carb. 88.4 grams; fiber 6.7 grams; iron 4.8 mg; calcium 101 mg. Here's a short video of an owner built Tumbleweeds home that is mostly complete. When a home is small you can afford higher quality components. This one is finished with wood throughout. 1. Pat tofu dry and cut into 1/2-inch cubes. Combine with 1/4 teaspoon five-spice powder in a medium bowl. 2. Heat canola oil in a large nonstick skillet over medium-high heat. Add tofu and cook, stirring every 1 to 2 minutes, until golden brown, 7 to 9 minutes total. Transfer to a plate. 3. Meanwhile, whisk water, oyster sauce, cornstarch and the remaining 1/4 teaspoon five-spice powder in a small bowl. Add broccoli, yellow and red bell pepper to the pan and cook, stirring occasionally, until beginning to soften, about 4 minutes. Add ginger and garlic and cook, stirring, until fragrant, about 30 seconds. 4. Reduce heat to low, add the oyster sauce mixture and cook, stirring, until thickened, about 30 seconds. Return the tofu to the pan along with peanuts and stir to coat with sauce; stir in hot sesame oil (if using). Shopping tips: Be sure to use “oyster-flavored” sauce (it’s oyster-free) to make this vegetarian; both it and oyster sauce are found in the Asian-food section or at Asian markets. Five-spice powder is a blend of cinnamon, cloves, fennel seed, star anise and Szechuan peppercorns. Look for it in the spice section or with other Asian ingredients. Nutrition: Makes 4 servings, 1 cup each. Per serving: 197 calories; 11 g fat (2 g saturated fat, 4g mono unsaturated fat); 0 mg cholesterol; 16 g carbohydrates; 12 g protein; 5 g fiber; 622 mg sodium; 517 mg potassium. Nutrition bonus: Vitamin C (230% daily value), Vitamin A (40% dv), Calcium & Folate (25% dv). Exchanges: 2 vegetable, 1 plant-based protein, 2 fat.Carbohydrate servings: 1. I've been wondering just how long it would take before Derba Mills got received the kudo's she earned from establishing THE environmentlally-correct alternative to dry cleaning. Clothesline Cleaners is changing the minds of all of us who use the service who appreciate taking clothes to the cleaners and have them come back without toxic chemical residue, plastic bags or throwaway hangers. Derba does it all, and has the endorsement from Governor Perry as well. Check out the video, and don't forget to take your "dry clean only" clothes to Clothesline Cleaners next time. Labels: alternative dry cleaning, Green Services. Geopressure energy involves harnessing the excess pressure in natural gas for production of electricity. The gas naturally has one hundred to eight hundred times more pressure than needed for household use. As the gas travels from the well through processing plants and onto storage and use the pressure is reduced at several points along the way. Since at least the 1980's researchers and entrepreneurs have explored ways to harvest the energy for electrical production. Because this energy is a byproduct of natural gas production which is currently being wasted it is considered a carbon free energy source. It also provides baseload electrical power which is the sort of power that utilities assert is most needed. Below is a press release concerning the award of a contract to a San Antonio company, Sologen Systems to manage a geopressure project that will produce 400 megawatts of power. They will be making a presentation to certified investors on the project on January 6, 2009 at 7 pm in Concord Plaza. Part of the information in the press release was also included in a San Antonio Express News 12/31/2009 article. SAN ANTONIO, Dec. 31 /PRNewswire/ -- Free Green Energy, LLC announced today, the engagement of San Antonio based Sologen Systems, Inc. as Project Manager for a major enhanced geopressure electrical generating project. The first stage of the project calls for developing a total of 200 geopressured wells in the States of Mississippi and Texas. The project is expected to ultimately generate baseload electrical power of at least 400 megawatts. Total capital cost is estimated to be $280 million. Free Green Energy's partner in the venture is Green Well Power, LLC of Vancouver, BC. Green Well Power is the exclusive North American licensee for the revolutionary linear power engine which will be used to harvest the wells' kinetic energy and drive the electrical generators. The linear driver was developed and patented by Linear Power, Ltd of Long Beach, Mississippi. Geothermal and geopressure resources are available across the United States. They provide renewable energy and can supply a constant source of baseload electricity. While the sun and wind are major potential sources of renewable energy, their energy varies greatly over time, as when there is no wind, or at night in the case of solar. Geothermal and geopressure energy however, are not interruptible and provide energy 24/7 while diversifying our nation's renewable energy portfolio. Geothermal and geopressure energy have low environmental risk and impact. Used with a closed-loop power plant, such as our linear driver, the system has near zero environmental impact and emits no greenhouse gases. Geothermal and geopressure energy also have the potential to make a significant contribution to energy independence. The resource size and domestic distribution, coupled with technology advancements will help reduce national dependence on hydrocarbons for electricity generation and free these critical resources for other uses. Free Green Energy, headquartered in Houston, Texas was organized in 2008 to identify and develop geothermal and geopressure energy resources and use them to generate and sell green electricity. Sologen Systems is a San Antonio, Texas based RE Development Company. Sologen Systems provides turn-key business development, strategic planning, project management and finance solutions for tax-advantaged RE projects. Sologen Systems specializes in large-commercial to utility-scale Solar PV Systems and Enhanced Geothermal & Geopressure Systems. Sologen Systems identifies the available and applicable government subsidies for each project and structures appropriate corporate relationships to maximize tax benefits and ROI.